Herein is presented the case report of a patient who had secondary infertility. Hysterosalpingography (HSG) and subsequent diagnostic hysteroscopy revealed an asymptomatic cervical diverticulum. In vitro fertilization (IVF) was suggested for infertility due to bilateral tubal occlusion. We also informed the patient that her diverticulum does not require surgical intervention due to the absence of symptoms. A 30-year-old woman, gravida 1, para 1, was referred to our clinic for prior cesarean section and secondary infertility. The patient became pregnant spontaneously and had a baby by cesarean section 5 years ago. The patient has attempted to conceive for the last 4 years. The patient reports menstrual bleeding for 10 days in every cycle. Menstruation occurs at 27-day intervals. The patient reports the blood volume as normal and indicates the occasional presence of dark-colored discharge. Upon gynecologic examination on 2 nd day of her menstruation we found the uterus anteverted, anteflexed, and semi-mobile. During transvaginal ultrasound scan, the uterus measured 78 × 45 × 50 mm, the thickness of endometrium was 5.5 mm and the shape of the uterus was normal. There was no significant change in the contours of the uterus. The right ovary measured 29 × 26 mm with six to seven antral follicles; the left ovary measured 36 × 29 mm with four to five antral follicles. 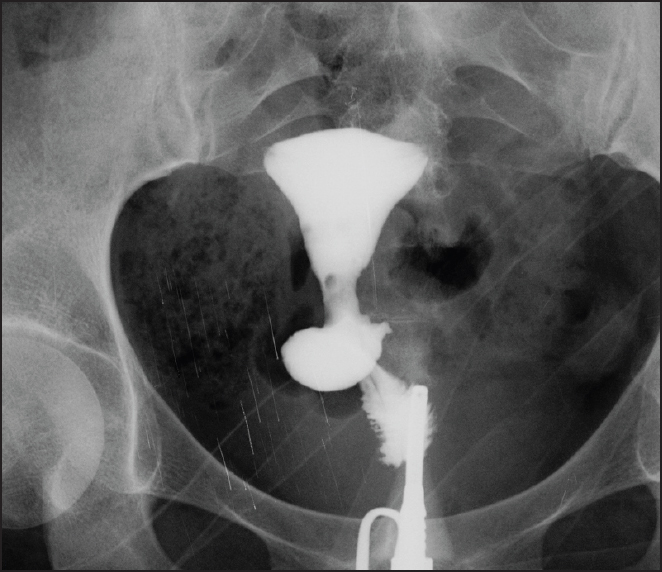 Hysterosalpingography (HSG) was performed during the proliferative phase and the shape of the endometrial cavity was normal. Bilateral tubal occlusion and saccular accumulation of contrast medium at 1/3 proximal level of cervix were also observed. A filling defect at the isthmus level measuring 3 × 4 mm was estimated to be an air bubble [Figure 1]. At the initial evaluation of HSG, the accumulation of contrast medium at the level of the cervix and the history of cesarean section suggests the presence of a defect at the site of the cesarean section scar or a possible uterovesical fistula. However, the size of the sacculation did not match the size of the bladder and the contrast medium did not dilute with residual urine. Thus, we eliminated the initial diagnosis of uterovesical fistula. The contrast medium was not spreading to the peritoneum and was limited to a small area. Thus, we eliminated the alternate initial diagnosis of a defect at the site of the cesarean section scar. The patient underwent diagnostic hysteroscopy 2 days after menstruation. The uterine cavity was observed to be normal and expanded, tubal ostia were observed clearly and bilaterally. On the upper 1/3 of the cervix, a diverticula with diameter of 2-3 cm was observed anteriorly [Figure 2]. Cervical diverticulum is a rare anomaly of the uterus that typically presents without symptoms. Only five previous cases are available in the Medline database. ,,,, Irregular bleeding is the most common symptoms and is brought on by the collection of menstrual material in diverticulum that gradually releases. Cesarean scar tissue may result in weaknesses of the uterine wall which result in secondary uterine diverticula. Dysmenorrhea, infertility, abnormal uterine bleeding, and ectopic pregnancy have also been associated with uterine diverticula. Surgical treatment may be indicated when significant symptoms are present. In the present case, the patient was asymptomatic. The patient was informed that her infertility is associated with the presence of tubal occlusion and adhesion, and the observed diverticula is probably congenital. For her infertility treatment we suggested in vitro fertilization (IVF). We also informed the patient that her diverticula does not require surgical intervention due to the absence of symptoms. In the event of abnormal enlargement of the diverticulum or the onset of significant symptoms associated with diverticula, the tissue may be excised by a surgical procedure. Seoud M, Awwad J, Adra A, Usta I, Khalil A, Nassar A. Primary infertility associated with isolated cervical collecting diverticulum. Fertil Steril 2002;77:179-82. Umezaki I, Takagi K, Aiba M, Ohta H. Uterine cervical diverticulum resembling a degenerated leiomyoma. Obstet Gynecol 2004; 103:1130-3. Coronado PJ, Fasero M, Vidart JA. Cervical diverticulum: An unusual cause of chronic menometrorrhagia. Eur J Obstet Gynecol Reprod Biol 2008;137:126-7. Bai J, Zheng G, Yang B, Lei L, Ren Q. Uterine cervical diverticulum containing a blood clot. Int J Gynaecol Obstet 2010; 111:269-71. Stamatopoulos C, Tsimpanakos I, McKenzie-Gray B, Gkioulekas N, Korkontzelos I, Magos A. An unusual case of cervical diverticulum identified by presence of 3 cavities at diagnostic hysteroscopy. J Minim Invasive Gynecol 2013;20:238-40. Suprapaneni K, Silberzweig JE. Caesarean section scar diverticulum: Appearance on hysterosalpingography. AJR Am J Roentgenol 2008;190:870-4. Engel G, Rushavich AM. True uterine diverticulum. A partial mullerian duct duplication? Arch Pathol Lab Med 1984; 108:734-6.